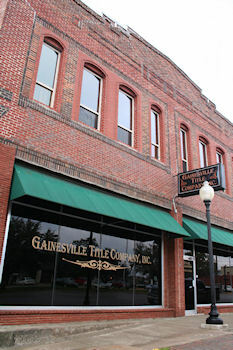 Gainesville Title Company respects the privacy and security of your non-public personal information ("Personal Information") and protecting your Personal Information is one of our top priorities. This Privacy Statement explains FNF's privacy practices, including how we use the Personal Information we receive from you and from other specified sources, and to whom it may be disclosed. FNF follows the privacy practices described in this Privacy Statement and, depending on the business performed, FNF companies may share information as described herein. Personal Information Collected We may collect Personal Information about you from the following sources: •	Information we receive from you on applications or other forms, such as your name, address, social security number, tax identification number, asset information, and income information; •	Information we receive from you through our Internet websites, such as your name, address, email address, Internet Protocol address, the website links you used to get to our websites, and your activity while using or reviewing our websites; •	Information about your transactions with or services performed by us, our affiliates, or others, such as information concerning your policy, premiums, payment history, information about your home or other real property, information from lenders and other third parties involved in such transaction, account balances, and credit card information; and •	Information we receive from consumer or other reporting agencies and publicly recorded documents. Disclosure of Personal Information We may provide your Personal Information (excluding information we receive from consumer or other credit reporting agencies) to various individuals and companies, as permitted by law, without obtaining your prior authorization. Such laws do not allow consumers to restrict these disclosures. Disclosures may include, without limitation, the following: •	To insurance agents, brokers, representatives, support organizations, or others to provide you with services you have requested, and to enable us to detect or prevent criminal activity, fraud, material misrepresentation, or nondisclosure in connection with an insurance transaction; •	To third-party contractors or service providers for the purpose of determining your eligibility for an insurance benefit or payment and/or providing you with services you have requested; •	To an insurance regulatory authority, or a law enforcement or other governmental authority, in a civil action, in connection with a subpoena or a governmental investigation; •	To lenders, lien holders, judgment creditors, or other parties claiming an encumbrance or an interest in title whose claim or interest must be determined, settled, paid or released prior to a title or escrow closing. Disclosure to Affiliated Companies - We are permitted by law to share your name, address and facts about your transaction with other companies, such as insurance companies, agents, and other real estate service providers to provide you with services you have requested, and for marketing or product development research. We do not, however, disclose information we collect from consumer or credit reporting agencies with our affiliates or others without your consent, in conformity with applicable law, unless such disclosure is otherwise permitted by law. Disclosure to Nonaffiliated Third Parties - We do not disclose Personal Information about our customers or former customers to nonaffiliated third parties, except as outlined herein or as otherwise permitted by law. Confidentiality and Security of Personal Information We restrict access to Personal Information about you to those employees who need to know that information to provide products or services to you. We maintain physical, electronic, and procedural safeguards that comply with federal regulations to guard Personal Information. Access to Personal Information/ Requests for Correction, Amendment, or Deletion of Personal Information As required by applicable law, we will afford you the right to access your Personal Information, under certain circumstances to find out to whom your Personal Information has been disclosed, and request correction or deletion of your Personal Information. However, our current policy is to maintain customers' Personal Information for no less than your state's required record retention requirements for the purpose of handling future coverage claims. Changes to this Privacy Statement This Privacy Statement may be amended from time to time consistent with applicable privacy laws. When we amend this Privacy Statement, we will post a notice of such changes on our website. The effective date of this Privacy Statement, as stated above, indicates the last time this Privacy Statement was revised or materially changed.